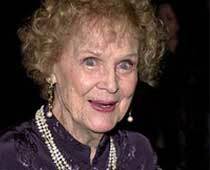 Veteran Hollywood actress Gloria Stuart, best remembered as the elderly Kate Winslet in Oscar-winning superhit Titanic has died. She was 100. Stuart had been diagnosed with lung cancer five years ago. A founding member of the Screen Actors Guild, Stuart died Sunday night at her West Los Angeles home. The actress had also survived breast cancer 20 years ago. "She just paid no attention to illness. She was a very strong woman and had other fish to fry," said Stuart's daughter Sylvia Thompson. Stuart had won an Oscar nomination for her role as Rose Calvert, the 101-year-old survivor in the James Cameron directed Titanic. A 1930s Hollywood leading lady, Stuart acted in movies like The Invisible Man, The Prisoner of Shark Island. She also appeared in Roman Scandals, Here Comes the Navy and Poor Little Rich Girl. She featured in 42 films between 1932 and 1939 under her contract with Universal Studios and 20th Century Fox. Stuart later retired from the screen in 1946. In Gloria Stuart: I Just Kept Hoping, her 1999 autobiography written with her daughter Sylvia Thompson, Stuart said that after reading the Titanic script, "I knew the role I had wanted and waited for all these many years had arrived. I could taste the role of Old Rose." At 87, Stuart became the oldest actress ever nominated for an Academy Award for her role in Titanic. Winslet was also nominated for her role and it was the first time in Oscar history that two performers were nominated for playing the same character in the same film.